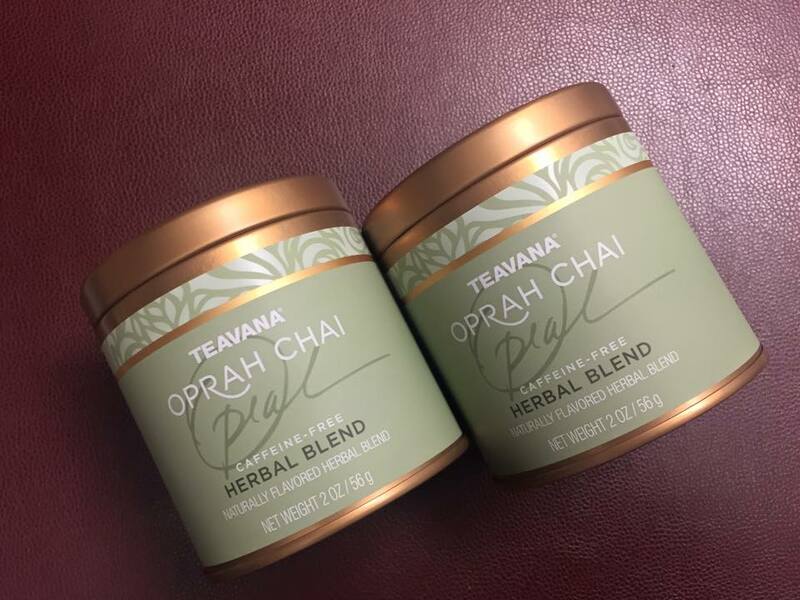 News: Oprah Chai Tea at Starbucks Now in an Herbal Version. Do you like hot tea at Starbucks? 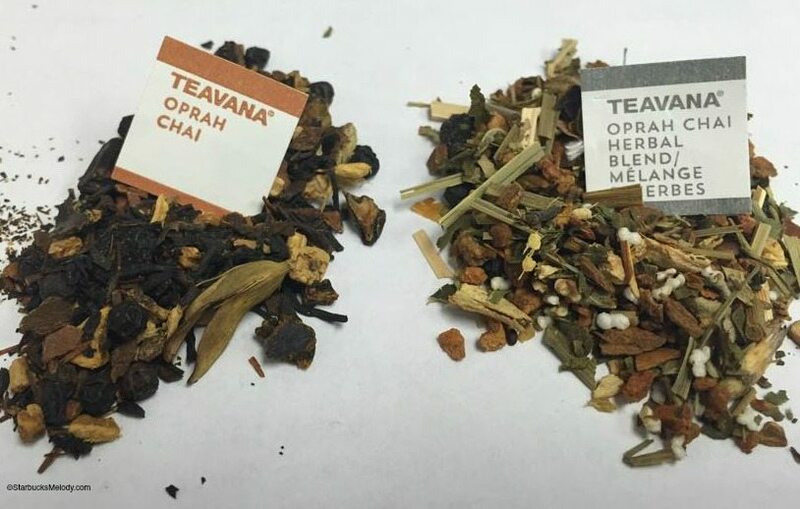 Now there are two different Oprah Teavana Chai tea options for you. There’s the original Oprah Chai tea version which is a cinnamony, spicy, traditional chai, and now you can get an herbal version. Both come in small tea sachets for your hot tea. The new herbal blend Teavana Oprah Chai is a blend of these ingredients: Cinnamon, apple pieces, ginger, carob pieces, lemon grass, chicory root, natural flavoring, blackberry leaves, cardamom fruit, basil leaves, amaranth, cloves, black pepper. I’ve heard a number of partners describe this as an all-around lighter flavor tea, though still with hints of cinnamon. This is new as of this month. It is possible that your store is still getting their shipment of the new herbal blend Oprah Chai, but all stores should have it soon. Please be patient. Like all other hot teas, when you order a tall, you’ll get one tea bag. If you order a grande or venti size, you’ll get two tea bags. I’m pretty sure that if you have a few minutes to wait, they can make these iced for you too. Thank you to Jocelyn on Instagram for letting me use these fabulous photos. And you can find me on Instagram here. From Jenn in Georgia: #DrinkOfTheWeek - Italian Roast Via with a little extra love. The Teavana Custom Chai Tea Test. I posted this earlier but don’t see it so I apologize if it’s a re-post. I normally order the brewed Oprah chai. It is very cinnamon-y and I very much prefer the old Tazo chai, but I do like the brewed Oprah chai better than the Oprah chai latte (and preferred the brewed Tazo chai over the tazo or “classic” concentrate latte because of all of the added sugar).. 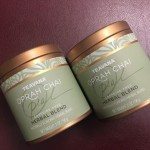 I tried the herbal Oprah chai last night and didn’t care for it. It was a refill after having an original Oprah brewed Chai so perhaps the strong cinnamon flavor of the original tainted my experience, but either way I do prefer the bold variety of flavors found in the old Tazo chai over either Oprah chai. The original Oprah chai really just tastes like cinnamon tea. The herbal one is a bit more complex, but too subtle for a chai. I do like that the herbal chai is decaf – Starbucks stopped carrying decaf Tazo chai after they converted from Tazo teabags to Tazo full leaf sachets several years ago and I missed having that option in their stores. Who knows if Starbucks will ever go back to carrying Tazo in their stores (I wish they would), but I do think they need more work on their tea lineup. They carry a masala chai in verismo format and perhaps that would be more to my liking if they offered that in the stores. It would also be nice if they carried tea bags/sachets instead of full leaf. I realize they are trying to “elevate” the tea experience by selling full leaf, but they aren’t brewing full leaf, they’re brewing sachets so that’s a bit hypocritical. The sachets are manufactured and available, they just need to be made available for retail sale. I’m never going to brew full leaf as it’s way too much of a hassle for me. It seems a bit contradictory to me that Starbucks is selling Kcups and Verismo pods for coffee and tea but not selling tea bags. Convenience is a major driver for consumers. I think they’re missing the boat here. I love the new herbal version. The original can be a bit much in the warmer months, but the new one is fantastic iced and is probably my new favorite of all the Teavana teas Starbucks carries. The herbal version is too weak than the originial Oprah Chai. If you let the non-herbal version sit and brew for about ten minutes, you’ll get the spicy and sweet flavors to really come through! I also wanted to say that the new herbal Oprah does not contain any rooibos. It is strictly an herbal blend. Maybe I’m crazy… but there’s not a button for Teavana Oprah Herbal Chai on the POS, but we have the tea to serve to customers. 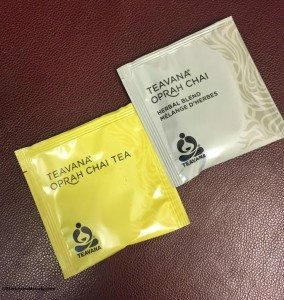 I personally prefer the black tea version of Teavana Oprah Chai. It’s delish!!! I am so grateful for a caffiene free option now as there hasn’t been anything since they’ve switched over to Teavana! (The passion tea hasn’t sounded very appealing to me) Can’t wait to try this new herbal version, thank you O! 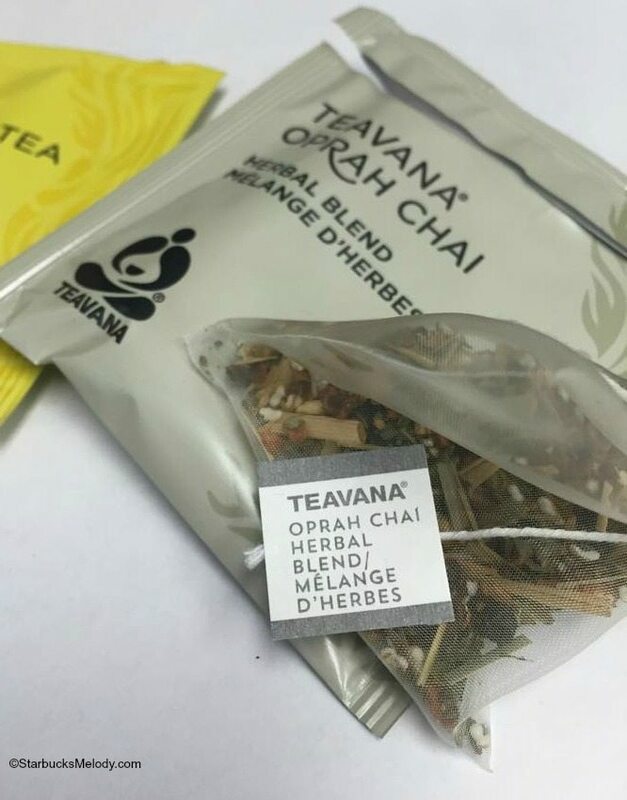 I’m finding that Starbucks is out of stock with the original Chai Tea (bags); instead they are just selling the new Herbal Chai Blend. I find the loose Chai Tea has a different, much weaker, taste then the bag tea. With that, does any one know where I can purchase a stock of the original Chai Tea in bags; the yellow packets? I tried the Oprah herbal chai tea, took a packet home. I was really surprised at how wonderful it was and no caffeine in it. I was the best herbal tea I ever tried. Now they sell it loose and I am worried that there may be any alteration to the flavour. I heard it isn’t as strong that way, I hope not. The tea bags were pyramid shaped. I personally have found with experience tea steeped in a pyramid shaped tea bag tastes better, way better. It does have to do with the geometrical shape and the dynamics I’m sure. I will try buying it loose because it was that good. Help! every store in Redding, CA is out of Oprah tea bag herbal chai tea. Real bummer when your going through the drive through! Tried it the other day, I really enjoyed it. Recently a I’ve had to cut all caffiene consumption from my diet including decaf since decaf still contains some caffeine. I’m so happy I now have an option. I tried some of the other teavana herbal blends and was very disappointed.